In celebration of Gary Valenciano's 25th year in the industry,Paolo Valenciano gathered some of his rock n' roll musician-friends to paytribute to his dad's music: Sugarfree, Kjwan, Rivermaya, Julianne, Out of Body Special, Us-2 Evil-0, and Urbandub. The special event was held last Wednesday, August20, at the Mag:net Café in Bonifacio High Street, Taguig City. Pop meets rock last August 20 at the Mag:net Café inBonifacio High Street as Gary Valenciano was treated to a surprise by his son Paolo to celebrate his dad's 25th year in the entertainment industry. Unlike the surprise party tendered by Star Records a fewweeks back at the Conway's Bar of the Makati Shangri-La Hotel, Gary wasawed to find young rock n' roll musicians playing his songs and expressinghow much he has influenced them as artists. According to Paolo—who is a member of the band Salamin—rockmusicians putting their own touch on a Gary V tune is something of a noveltyconsidering the fact that his father's music has always been categorized as popand radio-friendly. Hearing Gary's music laced with guitar distortions anddriving drum beats served as the antithesis of the recently-released tributealbum titled GV 25 (A Gary Valenciano All-StarTribute Collection). The specialanniversary album gathered 25 of the country's best solo performers like MartinNievera, Zsa Zsa Padilla, Kuh Ledesma, Jamie Rivera, Christian Bautista, JedMadela, among many others. "Basically it's a Gary V tribute kasi, di ba, ‘yong Star Recordsreleased the 25 artists tribute album? So kami parang gusto din namin magbigayng tribute so we got all these rock bands to perform tonight. We've beenwanting to do something like this ever since three years ago pa," Paolo toldPEP (Philippine Entertainment Portal) while everyone was anxiously waiting forGary's arrival. ROCKING FOR GARY V.The event organized by Paolo was simply a tribute party—meaning, the event wasnot recorded with the intention of releasing a live record. There is also noformal studio album in the works composed of bands playing Gary V music patternedafter the successful APO Hiking Society two-volume tribute disc. Participating in the event were Kjwan, Sugarfree,Rivermaya, Urbandub, Out of Body Special, and singer-songwriter Julianne. Imago'sAia de Leon was also present as she joined Rivermaya in their rendition of "NatutulogBa Ang Diyos?" Director Quark Henares, who served as the evening's host, alsoperformed together with designer friend Mich Dulce. Quark and Mich formallyintroduced their quirky band's name as Us-2 Evil-0. "I think I started singing because of that guy," Sugarfree'sEbe Dancel confided to PEP. The talented singer-songwriter shared his memorableGary V moment: "Nung grade 2 ako, nung may family reunion kami and may singingcontest and I didn't have a piece so I sang Gary V's ‘Reaching Out.' And then, Ifollowed his career and Gary's still around, grabe! He's getting betterevery day." All of the band members present that evening grew up listeningto the iconic singer-performer and although their respective genres are not thesame, it doesn't necessarily follow that there's no respect andadmiration on the part of these young musicians for the man dubbed as Mr. PureEnergy. "Alam mo halos lahat na yata ng music listeners or songwritersor musicians talagang naimpluwensiya din si Gary V, lalo na sa mga kanta niyana talagang magaganda ‘yong meaning. Isa talaga siya sa mga influences ko," Rivermaya'sJayson Fernandez proudly said. Although they're not listed as part of the performers,Sponge Cola's Yael Yuzon—who is another self-confessed Gary V fan—dropped by to watch the entire event. "Kasi ‘yong genre naman namin, medyo malayo naman talaga saginagawa ni Gary V to a certain extent. Although all local music naman areclassified under OPM but ‘yong idea lang na ang positive niyang tao. Parangdoon pa lang, the song becoming this positive influence on the people, parangnadadala ka na rin. Parang you also want to strive to be a better person.Parang as cheesy at it may sound, ganoon talaga, e, you want to be better,"smiled Yael, who was silently watching the entire show together with other fellowmusicians near the bar's front door. Rehearsing a Gary V number was a fun experience accordingto Julianne, who did an astounding cover of Gary's modern single, "Wait Forever." "I let my band learn it and then we met in the studio andwe're like, ‘Okay, how are we gonna do this?' We tried to put our own spin intoit but then, of course, we also did our best to preserve the integrity of thesong," explained the voice behind the hit song "Tulak Ng Bibig." Other notable celebrities also came to join in the fun, including AnthonyPangilinan, Christian Bautista, Jed Madela and Jodi Sta. Maria. 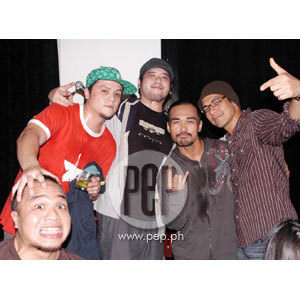 PEP alsospotted Parokya ni Edgar's vocalist Chito Miranda and Chicosci's Miggy Chavezenjoying themselves.